* Earlier this month, central defender Mame Saër Thioune (born 21.12.1989) and strikers Aliou Coly and Emile Paul Tendeng (born 31.12.1992) were named in the squad of the Senegal U-23 national football team. 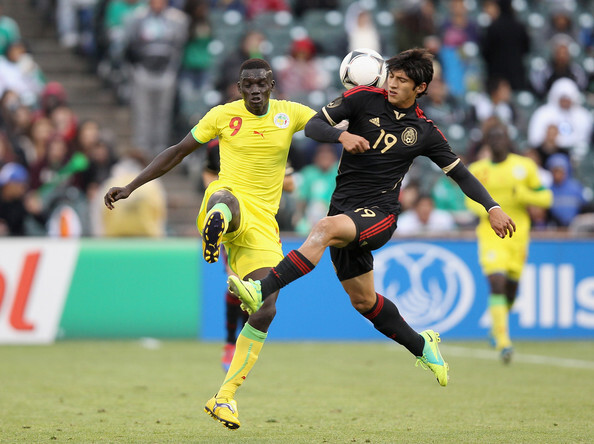 Both Coly and Tendeng started the international friendly match between Mexico U-23 and Senegal U-23 on 17.03.2012. Surprisingly, Coly has yet to score for Casa Sport so far this season despite being a regular player in the first team. Coly scored six or seven league goals during the Ligue 1 2010-2011. The picture is of Coly and is taken from Zimbio. * Stéphane Diarra Badji (born 18.01.1990), who left Casa Sport in January 2012 and joined Norwegian top level side Sogndal IL, has made an impressive start to his European career, starting all three of his team’s matches in the central midfield role. * From my point of view, ASC Dahra is the poorest team in the Senegalese Ligue 1, having only scored one goal in 10 matches through left-winger Samba Alassane Samb. * During the last couple of seasons, several foreign players have signed for clubs in the Senegalese Ligue 1. From my point of view, this is mostly positive for football in Senegal. Johnson Nwachukwu is an interesting Nigerian midfielder at DUC, apparently a former player of Orji Uzor Kalu FC, a club that is currently known as Abia Warriors FC, playing at second level of Nigerian football. Nwachukwu is most likely born in 1992 based on information from Senegalese newspapers. * Diambars, the famous academy in Diourbel, has had a sensational first season at top level in Senegalese football. Ousmane Mané (born 01.10.1990) is first choice goalkeeper, having played nine of ten matches, conceding only four goals. The regular left-back is Khassim Soumaré (born 23.12.1991). Soumaré was on trial at Norwegian second-level side FK Bodø/Glimt in March 2012. Mamadou Ndaw (born 29.10.1990) is arguably the best right-back at the club. El Hadji Sady Gueye (born 16.01.1990) and Djiby Ndiaye are brilliant central defenders. Matar Fall, Salim Mamadou Ndao (born 20.02.1991) and Emmanuel Gomis (born 21.05.1990) have all been impressive in midfield. Gomis, perhaps the most exciting prospect at the club, is an attacking midfielder with good leadership qualities. Souleymane Cissé (born 02.08.1990) is one of the best left-wingers in the league. Ousseynou Boye and Aristide Simon Diedhiou are apparently first in line when attackers are picked. The youngsters are pushed hard by the more experienced Mignane Diouf (born 01.02.1989), formerly of Tromsø IL (Norway) and Montreal Impact (Canada). Watch out for defenders Ousseynou Thioune and Seydina Keita and highly regarded 1992-born striker Ousseynou Ndiaye. Earlier this month, Ousmane Mané, Khassim Soumaré, Mamadou Ndaw, El Hadji Sady Gueye, Matar Fall, Salim Mamadou Ndao, Souleymane Cissé, Aristide Simon Diedhiou and Ousseynou Ndiaye, were all named in the squad of the Senegal U-23 national football team. According to some sources, Diedhiou scored one goal against Guédiawaye FC on 18.01.2012. If this is correct, both Diedhiou and Boye have scored three goals. * Mohamed Salzman, the new goalkeeper signed from CSS Richard-Toll, has started nine of 10 matches, conceding only five goals. * Defender Matar Kanté has cemented his place in the starting eleven of ASC Diaraf. I believe that Kanté is the same “Matar Kanté” that played at right-back for Yeggo Foot Pro during the Ligue 2 2010-2011 and eventually made the “Equipe type Ligue 2” (Team of the Season). * During the season 2010-2011, powerful striker Alpha Oumar Sow (born 12.02.1984) played for US Sénart-Moissy at fourth level of French football. Sow, a former player of Casa Sport, is now back in Senegal and his experience from European football has apparently made him a better player. * ASC Diaraf has signed an Ivorian striker called Alpha Tidiane Koné. At the time of writing, Koné is an unknown player to me. Apparently, Koné is a former player of Denguélé d’Odienné (Ivory Coast) and CS Hammam-Lif (Tunisia). * Earlier this month, attacking midfielder Pape Macou Sarr (born 25.07.1991) was named in the squad of the Senegal U-23 national football team. * Ibrahima Kidiéra, a product of the Elite foot de Dakar academy, is an interesting attacker. Kidiéra was part of the Senegal U-23 and the Senegal U-20 national football team in 2008. * Fans of Cameroonian football will perhaps remember central defender Pape Ousmane Ndaw from his stint at Cotonsport FC during the MTN Elite One 2010-2011. Ndaw is 28 or 29 years old. * Earlier this month, goalkeeper Issa Ndiaye (born 19.04.1991) was named in the squad of the Senegal U-23 national football team. * At the time of writing, burly striker Alassane Diallo is the top scorer in the Senegalese Ligue 1. In a league famous for producing few goals, six goals in 10 matches is rather impressive. Please note that the scorer of US Gorée on 10.03.2012 against CSS Richard-Toll is currently unknown. * Cameroonian Luc Kosso Atouba (born 31.01.1994) is the new left-back at Guédiawaye FC. While playing in Cameroon a couple of years ago, Atouba got in touch with an agent who took him to France for trials. The agent turned out to be a fraudster and Atouba was left on the streets without identification papers. Eventually, Atouba received help from Jean-Claude Mbvoumin, the precident of Culture Foot Solidaire, a French organization fighting against trafficking of young African talent in France. Hopefully, Atouba will flourish in safe environments in Guédiawaye. Tendeng had other dob in former article. And how old is REALLY Aliou Coly?? Our European based FIFA Registered Agents wish to market high quality and good background Senegalese players. Note: No financial involvement. If interested, kindly mail me via: noheem_ld@yahoo.com . Thanks! Défenseurs : Abdoulaye Ba (Academica Coimbra, Portugal), Saliou Cissé et Kara Mbodj (Tromso, Norvège), El Hadj Sady Guèye (Diambars), Pape Ndiaye Souaré (Lille, France), Victor Bindia (Sandefjord, Norvège), Souleymane Cissé (AS Pikine), Zargo Touré (Boulogne, France). Attaquants : Moussa Konaté (Maccabi Tel Aviv, Israël), Kalidou Yéro (Gil Vicente, Portugal), Ibrahima Baldé (Osasuna, Espagne), Sadio Mané (Metz, France).